Minin and Pozharsky monument and Saint Basil’s Cathedral in Moscow. A little bit of direct sun light leaked through the rear frame counter window. 1/250 f4.5 with some cheap ND filters and Lomography 100 colour negative film. I’ve been shooting digital now for over fifteen years … it’s convenient, automated, fast and predictable. Like many of us, I spend such a lot of money on the latest digital equipment and lenses with the highest resolution and lowest signal to noise ratios. However, i somehow feel that this digital perfection can sometimes lack the real creative soul that i had grown to love when i worked with traditional film. As you may have noticed, interest in traditional film and it’s unique look has recently been rekindled. Digital photographers have tried many ways to emulate the look of film with the latest cameras, software, actions and presets. However, in all honesty, if you want the classic film look, the only real way is to shoot traditional film. It’s analogue, unpredictable, time consuming and requires some careful technique, but ultimately, it’s this tender loving care that imbues a sense of soul and embodies the real spirit of traditional photographic materials. I wanted my images of Moscow to be different from all the run of the mill stock shots i’d seen online. I wanted to try and capture the enigmatic “Russian Soul” that so many great Russian authors have written about. What better way to do this than with a film camera whose roots had grown from the very foundations of Mother Russia … the legendary Lubitel. 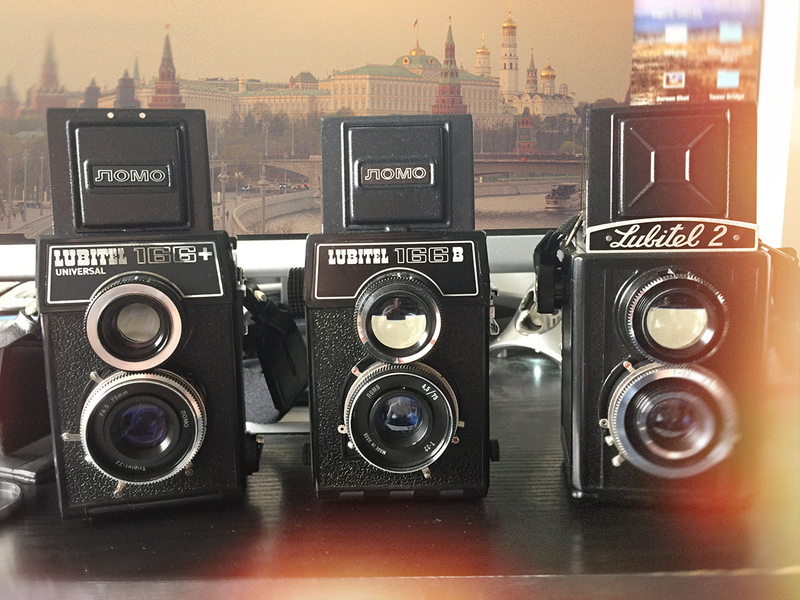 My collection of Lubitels (From left to right) … The Lubitel 166+ Universal, Lubitel 166 B and the Lubitel 2. A company that has whole heartedly embraced this philosophy and love of analogue photography is Lomography. Like a phoenix rising from smouldering ashes, they have rebuffed all things digital and pioneered the resurgence of traditional film photography with their own genres of cameras, films and lenses. Fuelled by this fiery passion and burning curiosity for anything analogue, they have reincarnated the classic Russian Lubitel twin-lens reflex camera and given it a new life in the form of the Lubitel 166+ Universal. It was time to embrace lens flare, light leaks, film scratches, dust spots and lens aberrations … it was time for some Lomography. It arrived in a colourful box, printed with some typically cool and avant-garde ‘Lomography style’ images. I removed the cellophane and lifted open the lid, to be confronted with a selection of smaller boxes and other curious bits and bobs. These included a square format, coffee table book full of inspirational Lubitel images, a Lubikin 35mm film adapter, manual cable release, some black plastic film masks, an instruction book, wide cloth strap, a roll of 120mm medium format film and of course the camera itself. The whole package is beautifully presented in special Lomo Lubitel wrapping paper which exudes a sublime quality and a care that over the years, i have not come to expect from mainstream camera manufacturers. It’s this sort of attention to presentation and detail that helps to embellish a brand’s reputation and i’d not experienced this elsewhere in some considerable time. As for the camera itself, the new Lubitel 166+ Universal looks very similar to previous incarnations of the classic Russian Lubitels, but was made of a finer grade plastic and it sported a helpful exposure guide on the back. Don’t forget that this is a fully manual camera with no internal auto exposure meter, so you’ll need to either follow this exposure guide, use a separate hand held light meter or use an app on your mobile phone camera to determine correct exposure. I have an iPhone and i used the free “MyLightMeter” app which proved to be invaluable and surprisingly accurate. It also kept my camera bag super light as we all carry our mobile phones with us in our pockets. Lomography have re-engineered the classic 75mm Cooke Triplet glass taking lens and removed the original self timer mechanism. In my opinion, this improved the ergonomics as the controls on the older Lubitels were a little cluttered for bigger fingers. There are two other metal rings around the lens, one that controls the aperture (ranging from f4.5 – f22) and the other one controls the manual shutter speeds. These range from 1/250 second to 1/15 second plus Bulb. The combination of these two rings will allow you to shoot in most situations, but can be a little restrictive to your creativity. With this in mind, I bought a set of neutral density filters on ebay for less than £15 that gave me two (ND2), three (ND4) and four (ND8) stops neutral density range. I also treated myself to a cheap ten stop (ND1000) neutral density filter for some long exposure antics and these all screwed nicely into the 40.5mm lens filter thread. These items are super cheap and the beauty of the Lomography ethic is that you are not after the highest resolution glass, but a low fidelity equivalent – so pennies can be saved on cheap filters in aid of Lomo creativity! As already mentioned, this camera is fully manual and relies upon a little photographic skill and knowledge to create the shots that you want. Even the mechanical shutter needs to be cocked manually using the lever astride the lens, which can be triggered either with your finger or via a manual, screw in push button cable release. This approach not only slows you down, but also improves concentration and helps to focus your mind on the image taking process rather than leaving it all to the camera’s electronics. View of The Moscow Kremlin from the Patriarch Bridge with some late afternoon light and lens flare. 1/125 sec f16 Lomography 400 colour negative film. Now we come to focusing! Once again, the lens is fully manual and comes equipped with no autofocus whatsoever! The larger lens is the taking lens and the smaller lens above this is the viewing lens. For most subjects a meter or more away, this isn’t a problem, however you may become victim to ‘parallax error’ when trying to compose and focus on very close objects. The taking lens focuses anywhere from 0.8m to infinity with four click stops. Focus is confirmed and the image is composed on the ground glass screen. This mechanism has been greatly improved on the classic Lubitels design by Lomography’s redesign as the pop up viewfinder has a perfectly flat ground glass which covers 100% of the entire image. With the older classic Lubitels, the centre was bright but it had such bad light fall off towards the edges that it was hard to not only focus but even compose the image. The camera can easily be used at waist level and the laterally reversed image can be seen on the ground glass screen with relative ease. In order to improve focus further, Lomography have also redesigned the flip down magnifying lens and introduced a split screen fresnel in the image centre to confirm perfect focus. This was one of the big drawbacks of the original Lubitel design a focus was always something of a hit and miss affair. Winding on the film is also fully manual as you’ve now no doubt come to expect! Since this is a 120mm medium format camera, you’ll maybe need to have a bit of a practice when loading the film for the first time. I initially made the mistake of winding on the 120mm film a little to far by aligning the “Start Here” arrow on the paper film back with the upper wind on spool. This caused the film to fog a little on the first frames and unless this is an effect you want, i suggest just winding the film on until the “Start Here” arrows first appear on the lower spool. The film needs to be carefully wound on to the next frame using the main Advance Lever on the right of the camera. Occasionally i found that the film advance got a little stiff, and i was tempted to advance the film by brute force, but a little fiddle with the 35mm Rewind Crank (on the lower left side of the camera) released the sticky roll and allowed me to easily wind to the next frame. Another innovation that was introduced by the Lomography redesign, was the invention of the 35mm film “Lubikin” panoramic adapter. This allows you to shoot any 35mm film instead of 120mm film, and since it exposes the image over the entire 35mm film area, it also introduces a rather cool ‘sprocket’ effect to your panoramic images. Once again, this is what Lomography is all about, real film special effects in camera without the use of Photoshop and plug ins. In order to rewind the 35mm film back into the canister (after you have shot the entire roll), Lomography also introduced a film Rewind Lever. This opens up opportunities for in-camera double exposures, and even allows you to change films mid roll which is a unique and an incredibly useful feature. To be able to see what frame number you are now shooting (having remembered to wind it on first! ), it’s necessary to view the numbers and symbols on the roll film backing paper through the round red filtered window on the Exposure Counter Wheel. With colour negative film and black numbers on a white backing paper, this is usually a fairy simple task. However, when i tried shooting slide film for cross processing effect, the numbers are grey against a matt, black paper film back and it was almost impossible to see in bright sunlight. Be aware that this red filter window is also not 100% light proof, so it can introduce light leaks in direct sunlight. Once again, this phenomenon can obviously be used to creative effect and i experienced both intentional and unintentional red tinted light leaks on several of my frames. The Lomography Lubitel 166+ Universal is less prone to these light leaks than my older classic Lubitels, so with a little experience the effect is more controllable. I love to see the effects of real light leaks on my images, it seems to give them life and soul and is another wonderful advantage of Lomography analogue imagery and a benefit of the latest incarnation of this Lomo classic. 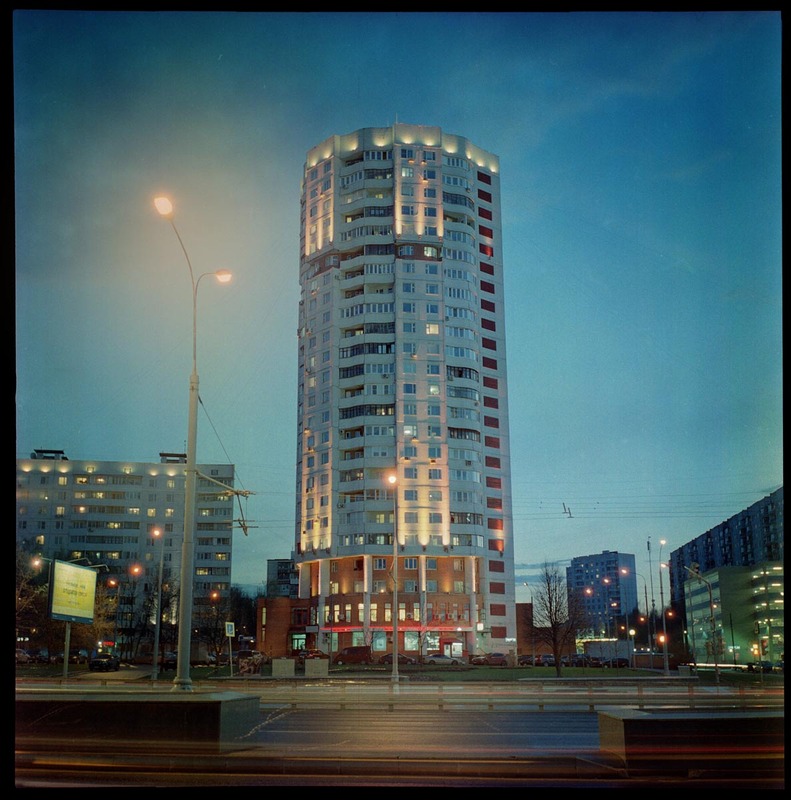 Having had my finger prints biometrically scanned (secret agent style) by the Russian embassy in London to approve my Tourist Visa, I took a four hour flight from Heathrow and arrived safely in Moscow. After a little research on the inter-web, i was able to familiarise myself with some of the prime city locations that i wanted to shoot. I organised a “Hit List” of top targets and prepared for my first “Hit”. First i needed to conquer the complexities of the Moscow Metro system, so Miss Moneypenny (ok, the receptionist at the hotel) wrote down what i needed on a piece of paper. I stealthily slipped this to the agent in the Moscow ticket office and acquired my week long underground pass for less then £10. So far, all was going according to plan. Like any capable and adept professional, I first like to familiarise myself with my subjects. I like to get to know a little about them and develop an understanding of where they are, how they look in different light and where the best angles are to shoot from. In my experience, this has always been the most successful approach so i largely spent the first day scouting the streets and finding my way around. 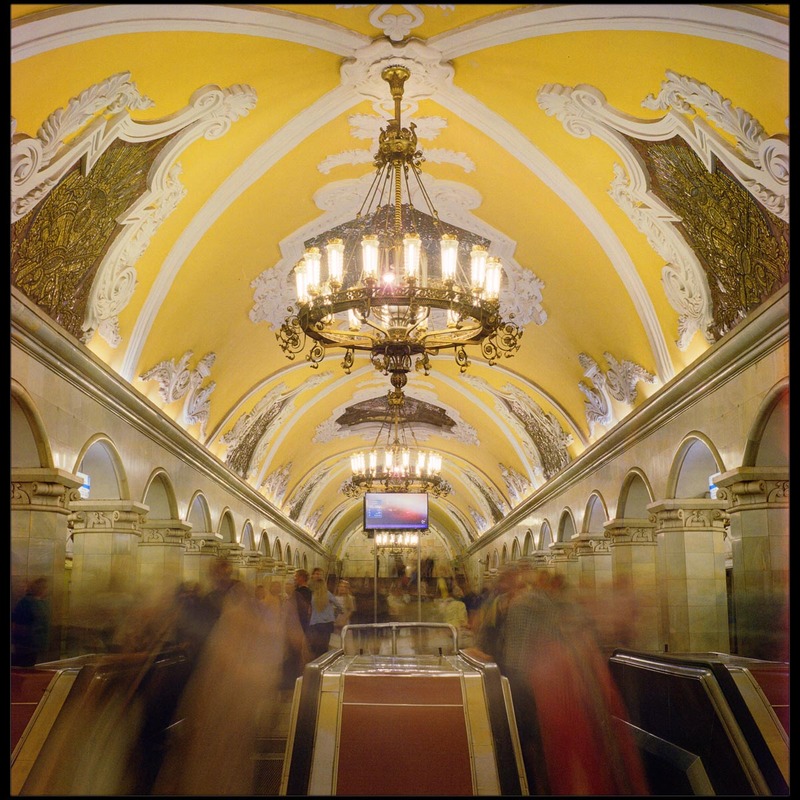 Komsomolskaya is one of many incredible Moscow Metro underground stations. 1 sec exposure f5.6 Lomography 400 colour negative film and some ND filters. The iconic St. Basil’s Cathedral on the edge of Red Square. 1/125 sec f4.5 with some stacked ND filters on Lomography 100 colour negative film. 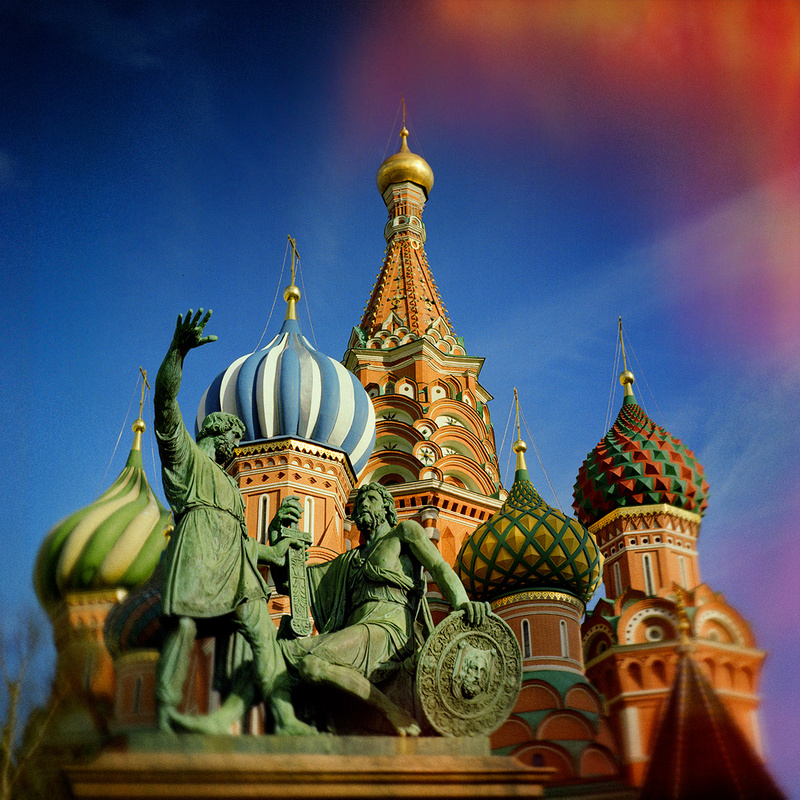 Next on my “Hit List” was Red Square and St Basil’s Cathedral. Inevitably, such an iconic location is always busy and i took an hour or so to scout about and explore various angles and options. With the standard Lubitel lens, and with so much open space, it was easy enough to move back far enough to fill the frame with the cathedral. However, at eye level the composition lacked foreground interest and i needed some way to draw the viewer into my picture. Looking around i saw some interesting white lines on the floor that led towards my subject. I crouched down and placed the camera on the cobbled square and looked down onto the ground glass screen. I wanted to shoot wide open to take advantage of shallow depth of field that the medium format lens gives and throw the foreground completely out of focus. This is the direct opposite of what we’ve all traditionally been taught in “Photo School”, but i’m shooting Lomography style, so the rulebook goes out the window. I also like the feel of the Lubitel lens wide open as it’s prone to vignetting and a little softness – both effects that i wanted to encourage. It was sunny, and the fastest shutter speed on the Lubitel is restricted to 1/250 second, so i once again made use of my cheap stacked ND filters to cut down on the light and let me shoot at maximum aperture within the restricted range of shutter speeds. It was then just a case of waiting for the crowds to clear and give a nice clean line leading towards the cathedral. I was shooting on Lomography colour negative 100 film, which is a slow speed film and known for its sharpness and fine grain. 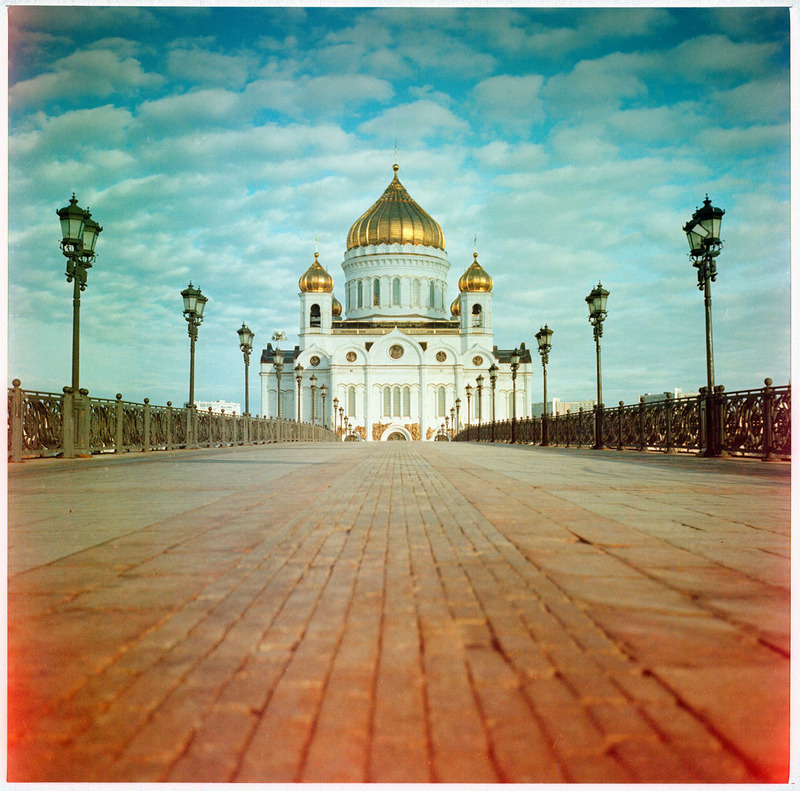 The vivid colour reproduction of this film emulsion was also perfectly suited to the bright sugar candy paintwork and vivid blue sky of St Basil’s Cathedral. Vintage Russian carousel. 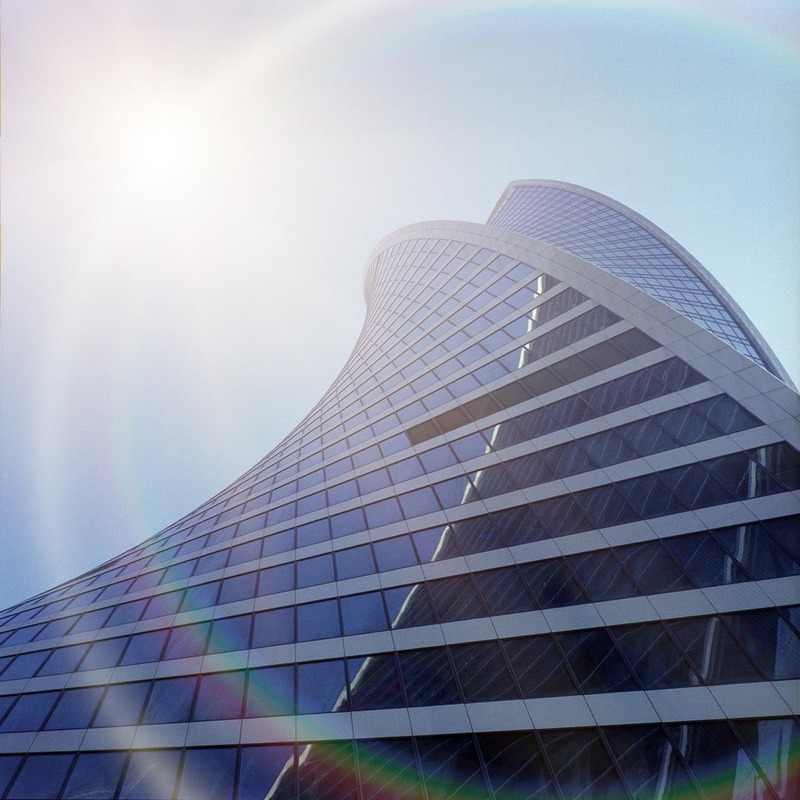 1/125 sec f 4.5 and some stacked ND filters caused some unexpected lens flare on Lomography 100 colour negative film. The afternoon light was getting lower in the sky and with this came the beautiful warmth and softness that we photographers (im)patiently wait the entire day for. 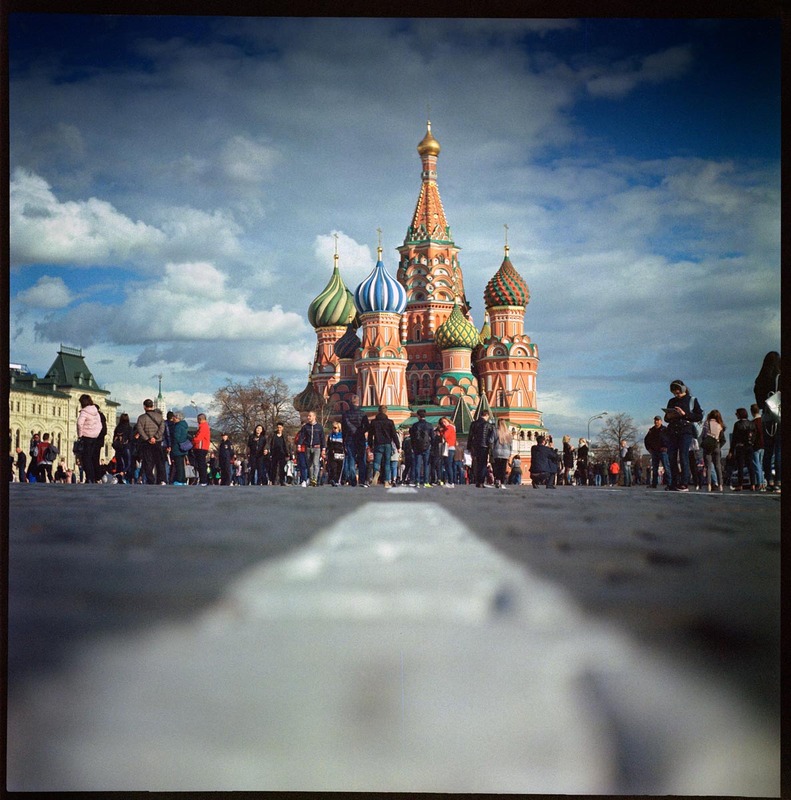 My rambles around Red Square with the camera were a pleasure to experience, and the Lubitel seemed immediately at home in Moscow. It’s an incredible city, and reminders of it’s turbulent and complicated communist past can be found round every corner. 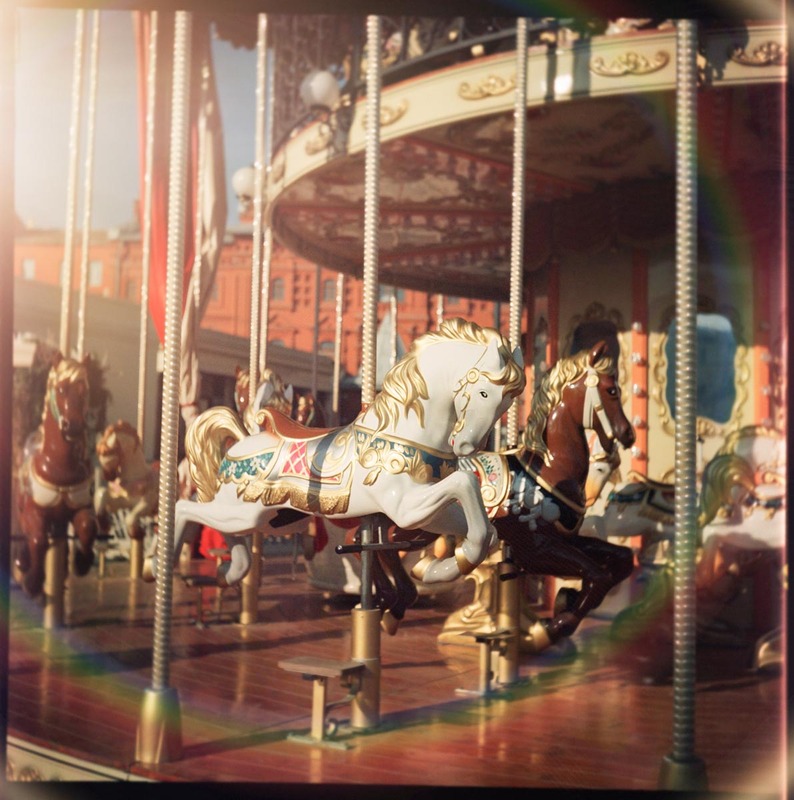 I stumbled across a beautiful vintage carousel, that was standing forlorn and lonely in the late sunlight. I tried a few angles with the Lubitel, but ultimately chose to focus on the main white wooden horse that appeared eager for the music to start and be called to prance. By focusing relatively close, i hoped to minimise the depth of field when shooting wide open and accentuate the wonderful bokeh of the lens. Once again, i chose to attach some of my cheap neutral density filters which must have caused some internal reflections and generated a wonderful rainbow lens flare effect that i hadn’t fully anticipated. Again, shooting on a slow, 100 speed colour negative film made the colours beautifully saturated and the wide aperture introduced some additional softness and vignetting. View of the Moscow Kremlin from the Patriarch Bridge at dusk. 4 seconds at f5.6 with Lomography 400 colour negative film. 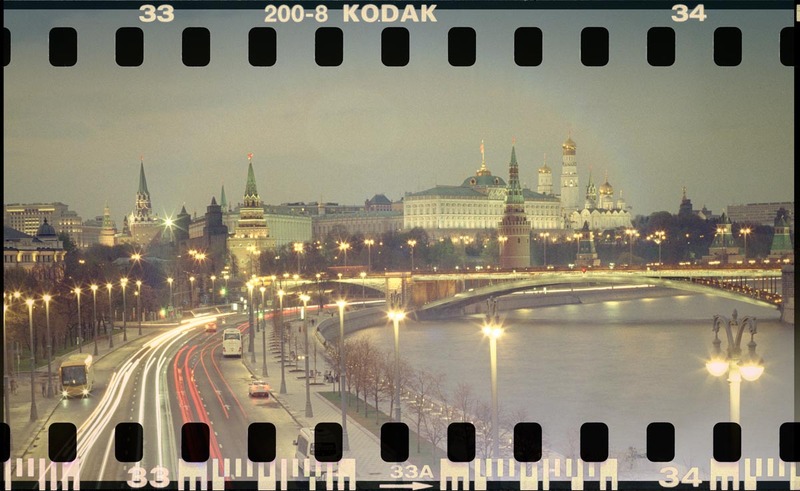 Next on my “Hit List” was another iconic and world famous view i’d seen so many times, the view of the Kremlin beside the Moskva River. 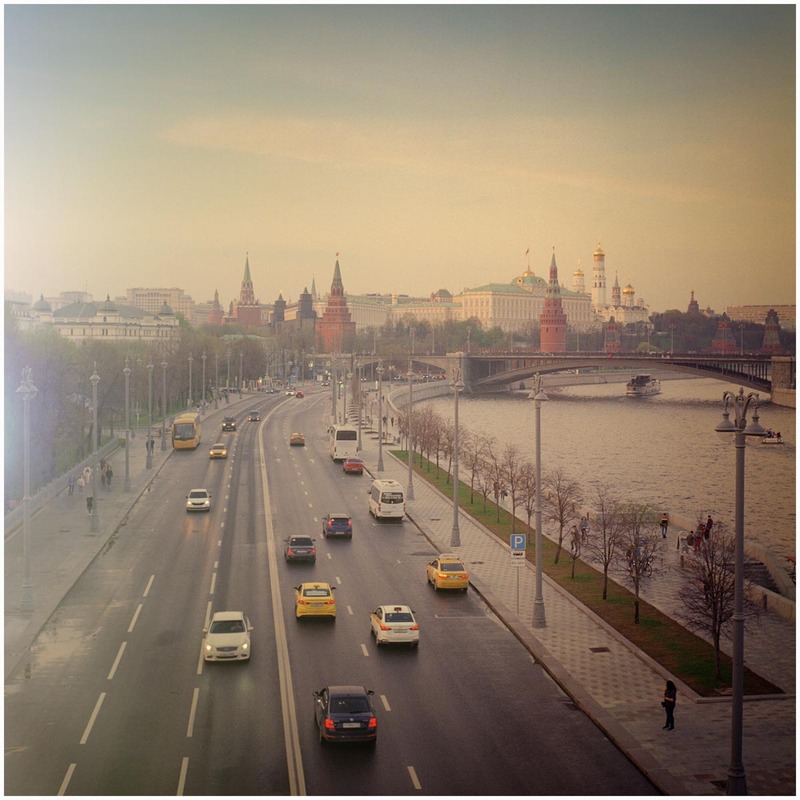 I’d carefully researched my target and understood that the shot could be made from the Patriarch Bridge near the Cathedral Of Christ The Saviour. It was a little walk away, but exploring a city by foot really is the best way to experience it and get a feel for your surroundings. The Cathedral was another shot i wanted to make so i could kill two birds with one stone and scout another shot on my list. The view that confronted me needed more of a short-telephoto lens and the Lubitel was restricted in this respect to the single fixed standard lens. However, hidden away in my bag i’d stored the Lomography 35mm “Lubikin” adapter, which would allow me to frame the shot as a panoramic and also take advantage of the in camera 35mm film sprocket hole effect. I had some time before the lights would come on at dusk, so i quietly sat on one of the nearby benches, carefully fitted the “Lubikin” adapter and inserted a roll of Lomography 400 ISO colour negative film. The lower light levels meant that i needed a faster film for longer exposures, so this seemed the right film for the shot i had envisaged. I rotated the Lubitel 90 degree to a horizontal position, and adjusted the composition. It’s a little tricky to do, as the the images is laterally reversed on the ground glass screen, but Bond was never afraid to rise to a challenge and with a little bit of patience, I managed to frame the image how i’d wanted. As dusk approached, I saw the scene slowly come to life as the street lights woke up and the rush hour traffic rushed about its business. Predicting exactly how the traffic trails would appear on the final film was tricky. I had become used to the convenience of shooting digital and you know what you’ve got on location before you leave. Not so with film, there’s always a little mystery, black magic and the sense of uncertainty until the film is returned from the processors. I used my trusty iPhone app to calculate the exposure, and i relied upon the wide film latitude of colour negative film to record the detail from the shadows to the brightest highlights. To achieve the traffic trails, i set the shutter ring to Bulb exposure and carefully pressed upon the cable release to trip the manually cocked shutter. Exposure was 4 seconds at f5.6. I rewound the roll using the hand crank and felt confident that another “Hit” had been eliminated. Soviet tower blocks and traffic trails. 4 seconds f 5.6 on Lomography 100 colour negaive film. On my walk back to the hotel, i was seduced by some almost futuristic architecture from the communist era. We don’t have buildings like this in Britain, and the polygonal tower blocks were so typically Soviet that they were hard to resist photographing as they began to glow from within. I set up the Lubitel at waist height on my lightweight travel tripod and selected Bulb exposure once again. The square format of the Lubitel perfectly balanced my composition and as the traffic passed by, i fired off a few frames and retired to my hotel for an early morning shoot the following day. Christ The Saviour Cathedral. 1/60 sec f4.5 with stacked ND filters. The light leaked on loading to create this unexpected effect shot with Lomography 100 colour negative film. 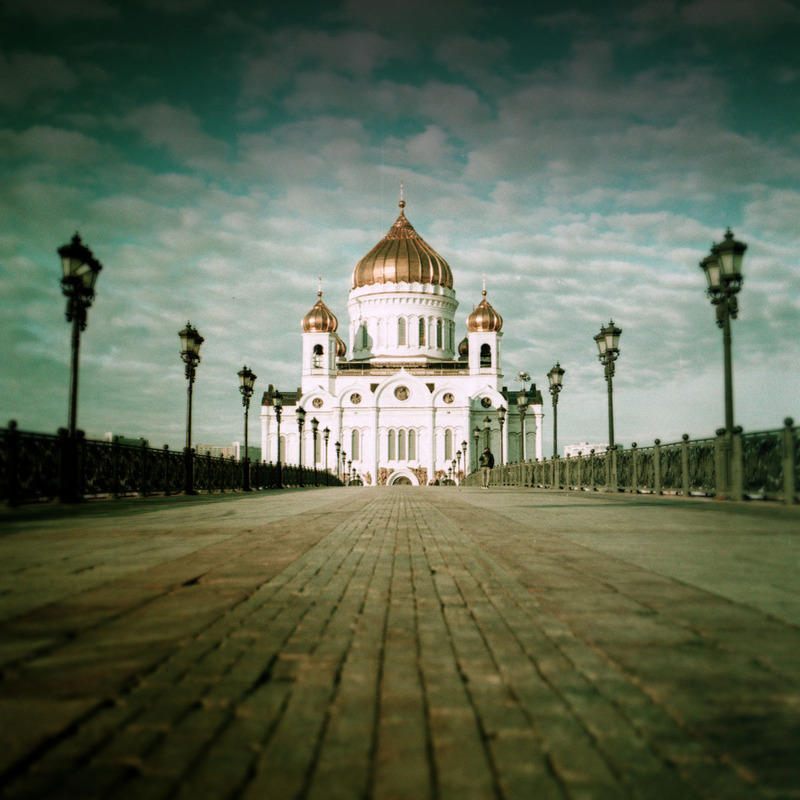 I arrived at the Cathedral Of Christ The Saviour before sunrise at 4am and had the entire place to myself. It’s a popular location with tourists, and shooting alone at this time in the morning in such a spiritual place was an almost meditative experience. This time I loaded a roll of 120mm Lomography X Pro 200 Colour Slide Film and, since i liked the texture of the paving stones, I once again chose a low level viewpoint to add foreground interest. The Lubitel is perfect for this type of shot as i could sit down on the floor and just look down onto the ground glass screen. I piled on some more neutral density filters to allow me to take advantage of the widest f4.5 aperture and waited for the sun to rise above the concrete Moscow skyline. As i waited, a wonderful, almost herringbone cloudscape formed above the golden ogee towers of the cathedral. It was perfect, and i triggered the mechanical shutter on my Lubi’ with the tip of my finger at 1/15 second. I was a little unsure of how accurate my iPhone light meter would be for colour transparency film since it is notoriously tricky to perfectly expose in high contrast situations. With slide film it is actually better to expose for the highlights rather than the shadows as you do with negative film. I’d have preferred a handheld incident meter or perhaps an incident attachment for my iPhone which would have allowed me to have measured the light falling on the scene rather than the reflected light off the scene. However, I just framed the shot and bracketed a little above and below the suggested iPhone settings to be sure exposure was spot on. Christ The Saviour Cathedral with cross processing. Shot at 1/125 sec f4.5 with some stacked ND filters and Lomography 200 Slide (transparency) film. E6 film cross processed in C41 colour negative chemistry for ‘Lomo Look’. I also wanted to try a few ‘Lomography style’ shots using the somewhat experimental technique of cross process film development. I therefore rewound the unfinished roll of Lomography X Pro 200 Colour 120mm Slide Film, which i had planned for normal E6 development, and reloaded a similar roll that was to be cross-processed in C-41 colour negative chemistry. This ‘wildchild’ technique rendered some very interesting colours and offered a great ‘Lomo’ alternative to standard film processing. I’d also deliberately tried letting in some direct sunlight through the red filtered frame counter window, which caused colourful light leaks all over the image. The grain was the size of golf balls, the contrast was high and the highlights a little fried – but all part of the ‘Lomo Look’ and fun techniques to play around with. I fired off a few more rounds and felt quietly confident that the this one could also be crossed off my “Hit List”. 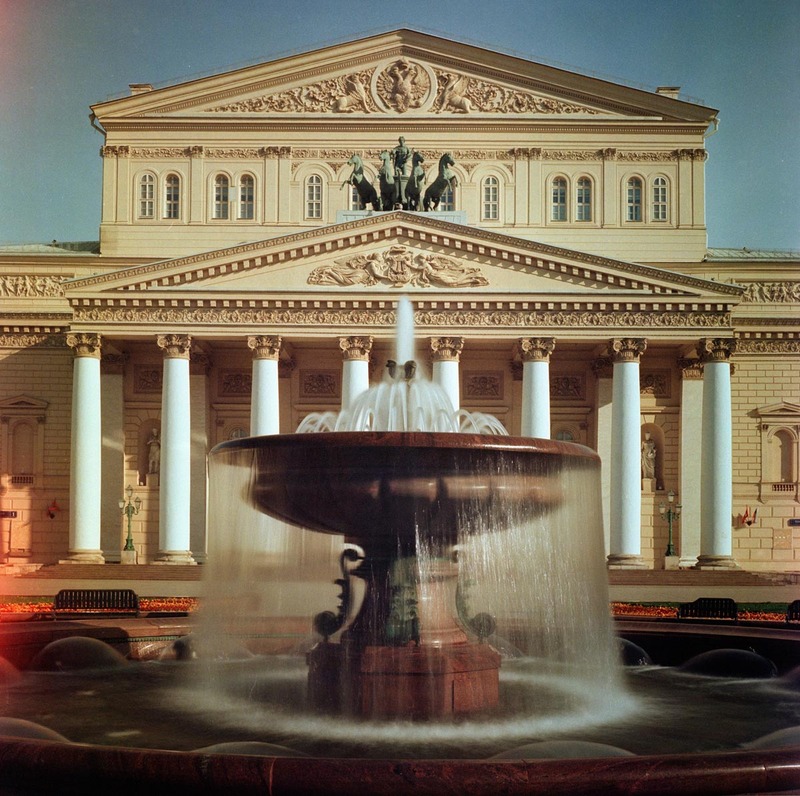 The famous Bolshoi Ballet Theatre. 1 sec f8 with stacked ND filters and Lomography 100 colour negative film. Whilst the light was warm and relatively soft, I’d detoured back to a location i’d previously visited the day before, the world famous Bolshoi Theatre. This is where Tchaikovsky had premiered the classic ballet Swan Lake and, with such historic importance i felt i needed to take a shot. The fast running water from the fountain clearly heralded a long exposure blur technique and so i stacked up my cheap neutral density filters and screwed them onto the front of the Lubi’ lens. The great advantage of twin-lens reflex cameras is that the taking lens, with the dark filters attached, didn’t affect the view through the ground glass screen, so I could easily compose the shot. I stopped down to f11 as i needed some depth of field for this shot, and with an exposure time of 4 seconds it blurred the water into almost a perfect mist. 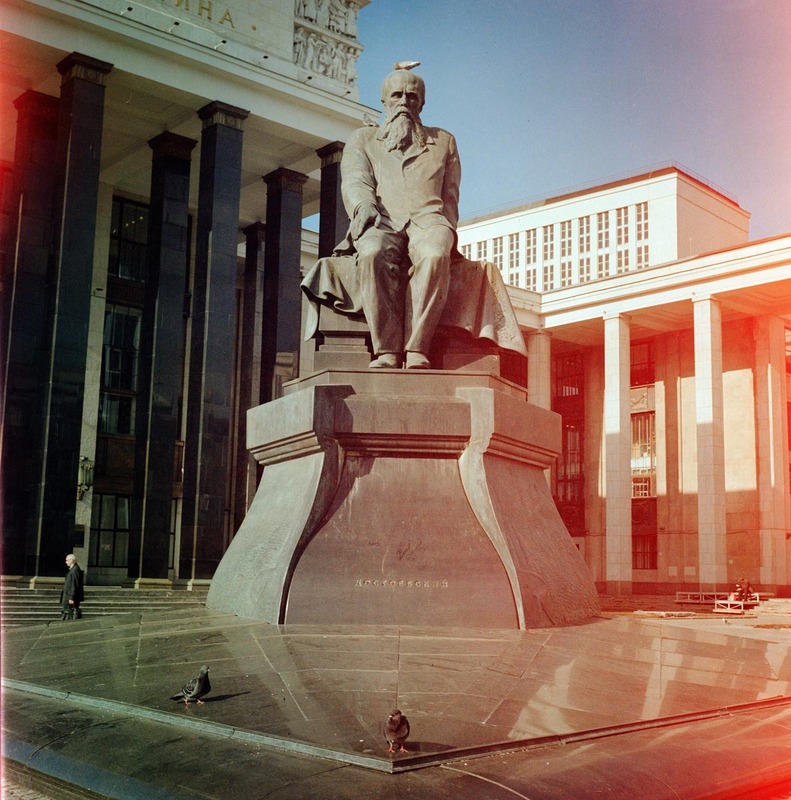 Dostoevsky statue and Lenin State Library of USSR. 1/125 sec f4.5 with stacked ND filters on Lomography 100 colour negative film. Walking past the old Lenin State Library Of The USSR, I was once again struck by the retro communist architecture and spotted a statue to the great Russian author and philosopher Fyodor Dostoevsky, who had played an important role in identifying and documenting the enigmatic ‘Russian Soul’. I couldn’t resist firing off another couple of frames as some pigeons settled upon his head, doing what pigeons do best, disrespectfully oblivious to his literary genius and significance. On development of the film, it appears I’d must have forgotten to close the shutter gate on the rear frame counter window and this had caused more in camera light leaks, which serendipitously added to what could’ve been an otherwise mundane record shot. Two more shots executed, and another subject had been eliminated from my “Hit List”. Photographing any well known location isn’t just about shooting the famous sights and views, it’s also about trying to capturing the spirit, the essence and the true soul of the place. Certain subjects will sometimes simply catch your eye and cry out for you to shoot them. 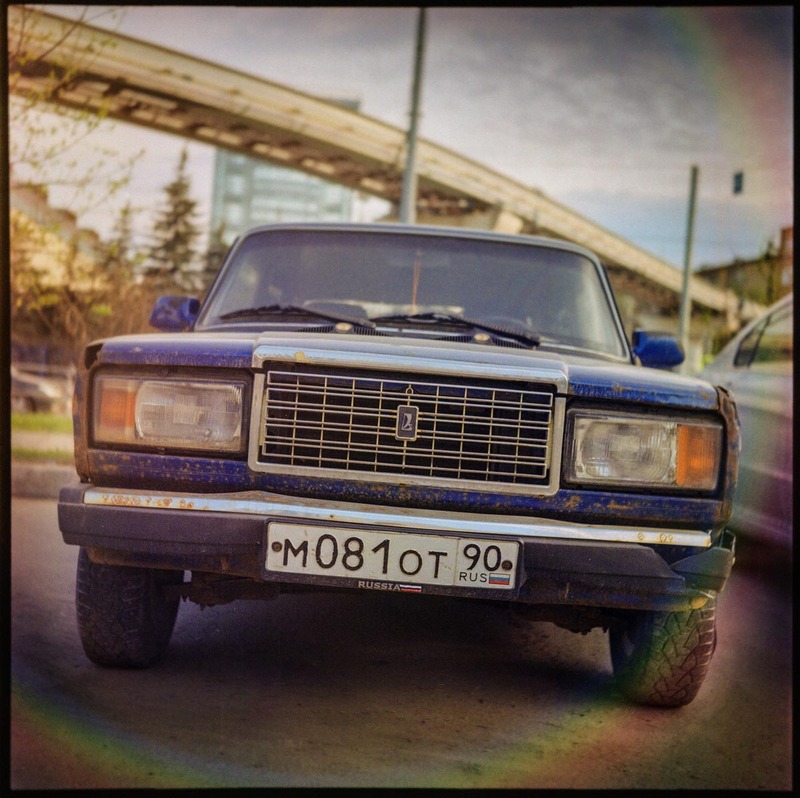 Whilst wandering the back streets, I came across this tatty old Russian Lada Riva. It appeared to be held together with just rust and fresh air, but to me, it epitomised the hardship and changes that Russia itself had endured throughout it’s recent turbulent history. Once again, i stacked all the neutral density filters to reduce the light enough to enable a wide aperture and a suitable shutter speed. Shooting at f4.5 introduced the vignetting effect that i had grown to love, and the soft edges, close focus and shallow depth added to the overall dreamy feel of the photograph. I chose to tilt the lens slightly diagonally, to introduce some dynamism and movement to an otherwise static subject, and used the split screen fresnel to focus on the registration plate, letting everything else fall out of focus. Hand held, i recall the exposure was about 1/125 sec at f4.5 on Lomography 100 colour negative film. Old classic Lada Riva on backroad. 1/125 sec f 4.5 with some stacked ND filters and Lomography 100 colour negative film. Exploring cities with a camera and a mind to produce as many high quality images as possible in a short space of time, is physically and mentally hard work. Each long day i walked up to 30,000 steps so i was glad that my Lubitel and travel tripod were so light weight. The camera itself had been a huge talking point whenever i took it out in public. Every day, Russians recognised it as a symbol from their communist past, igniting conversation and breaking down barriers that language alone could only hope to communicate. Wandering the streets, I fell in love with the history, the people, the literature, the culture, and i began to feel that enigmatic yet elusive ‘Russian Soul’. I realised that Moscow is undoubtably a place of enormous contradictions, many of which still remain coded in secrets from its complicated and tempestuous communist past. Skyscrapers in Moscow City. 1/250 sec f 5.6 with stacked ND filters and Lomography 100 colour negative film. These days, with automated camera electronics taking away much of the need for technical knowledge and ability, it’s all to easy to produce countless dull and lifeless photographs that lack real soul. Returning to the rudiments of traditional film cameras and elementary photography was a refreshing change to modern day digital photography. It necessitated a slower, more contemplative approach and a thought process that can only help to push the boundaries of your artistic and creative visions. In my opinion, digital photography really is too easy these days, so if you want a challenge and you want to test your true ability as a proper photographer, then i would highly recommend throwing away the established rule book and trying some Lomography style imagery. Rules are made to be broken and with the Lubitel you’ll have the right tool to shoot exciting, fresh imagery that will help to make you a better photographer. Mission accomplished. In 1991, a group of art students in Vienna, stumbled upon a small Russian 35mm film camera called the LomoKompakt Automat (LC-A). Its unconventional analogue attributes appealed to the students and soon their photographs started to attract a cult following and a community of like minded souls. Lomography had been born, and by bucking mainstream digital trends, Lomography has since developed and become the industry’s ‘wildchild’. Lomography is all about analogue cameras, film, fun, creativity, experimentation and embracing the avant-garde. What started with the legendary Lomo LC-A, was soon followed by an armoury of other cameras and ‘art lenses’ that have been specially designed to expand analogue creativity. These are fully supported by a range of Lomography’s own silver-gelatine based film emulsions which encourage you to try new and exciting techniques. In addition to standard film emulsions, they have introduced a range of unique films including the time aged “Lomography F2”, a colour biased slide film called “Lomochrome Purple” and “Lomography Lobster Redscale” colour biased negative film. Film formats ranging from 35mm and 120mm film formats are supported, but Lomography even produce 110mm and 16mm movie film. A special LomoLab Service also helps to develop, scan and print your analogue masterpieces and fully support your creative visions. For more information and to become part of the Lomo community, simply visit www.lomography.com where you will will be able to view their free online magazine, shop and photo galleries. If you’re not already familiar with Lubitel cameras, allow me to give you a brief photographic history lesson. The name “Lubitel” (Russian – Любитель), translates as the word “Amateur” and it refers to any of the several medium format twin-lens reflex film cameras manufactured in Russia by an optical company called Lomo (“Leningrad Optical Mechanical Association”) since the 1950’s. The Lubitel was designed as a camera manufactured by Russians for the Russian people and they took a great deal of pride in it’s production. This doesn’t mean they were particularly good quality, (actually quite the opposite), but the Lubitel was one of the first affordable medium format film cameras that appealed to the mass market and the hard working man. Almost every Russian family owned one and because of this, the Lubitel gained almost legendary status and became engraved into the Russian psyche and culture. The first Lubitel was manufactured around 1950 and had a similar design to the now classic German Voigtländer Brillant. The Lubitel was also based upon a twin-lens reflex camera called “Komsomolets” (Russian – Комсомолец and meaning “Young Communist”) that had first been manufactured by Lomo immediately after the second world war. The Lubitel was a twin lens reflex film camera that was made out of black bakelite and housed a simple Cooke Triplet glass taking lens. Focus and composition was (and still is) achieved by looking down through a bright ground glass screen on the top of the light proof box. The screen had a flip up curtain that enabled the viewer to better see the laterally reversed image before the shutter was tripped. The bright and 75mm lens was consider to be a standard lens for 120mm (6cm x 6cm) medium format film and provided surprisingly sharp images that yielded good contrasty prints or slides. Exposure was fully manual and the aperture and shutter were literally dialled into the lens rings before the mechanical shutter was cocked and tripped. To wind on to the next frame (usually twelve per roll of 120mm film), you simply turned the knob one full rotation and carefully watched the symbols and numbers on the paper film backing through a deep red view filter on the camera back. The practicalities of all this was something of an acquired art, but like most things, practice made perfect and the simple design proved incredibly popular to many keen amateur photographers. The Lubitel camera through all it’s various incarnations, ceased production in 1988 when the original company Lomo was bought out by a new commercial enterprise started by a group of Viennese art students who were inspired by low fidelity photography. The name Lomography had been born and the rest is history as they say. Lomography bought the design rights to the Lubitel and developed their own version called the Lubitel 166 + Universal.